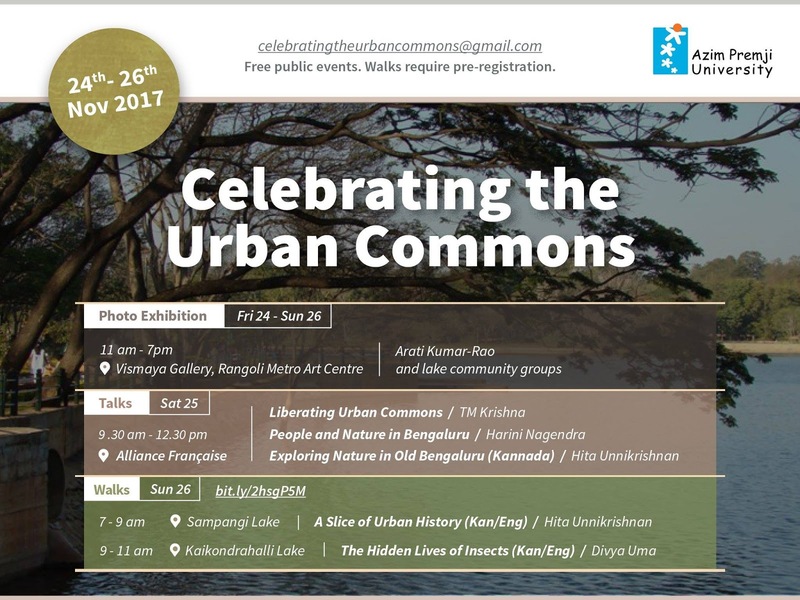 As part of a three day event "Celebrating the Urban Commons" organised by Azim Premjii University we were invited to showcase the story of our lake at the Vismaya gallery, Rangoli Art Metro from 24th to 26th Nov.
We had enough and more photos of the lake from then to now. 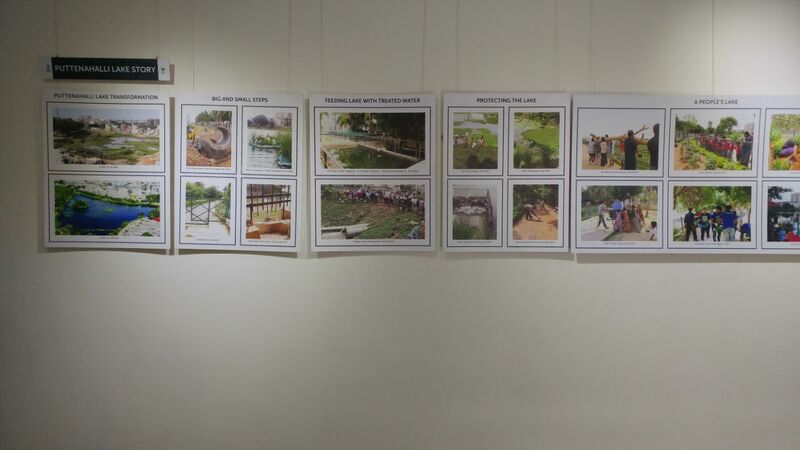 We finally chose what we thought to be the best representations of PNLIT's work, volunteers, children and adults, transformation of the lake from then to now. Aparna Rajagopalan did the layout of 23 photographs in seven frames. The organisers had said we could have games as well. Our creative juices started flowing. We decided on two simple, if old fashioned games, an electronic matching game and another which tested the steadiness of the hand. We wanted both to be connected to the lake. Geetha Bhandary made the first with photos of our birds. 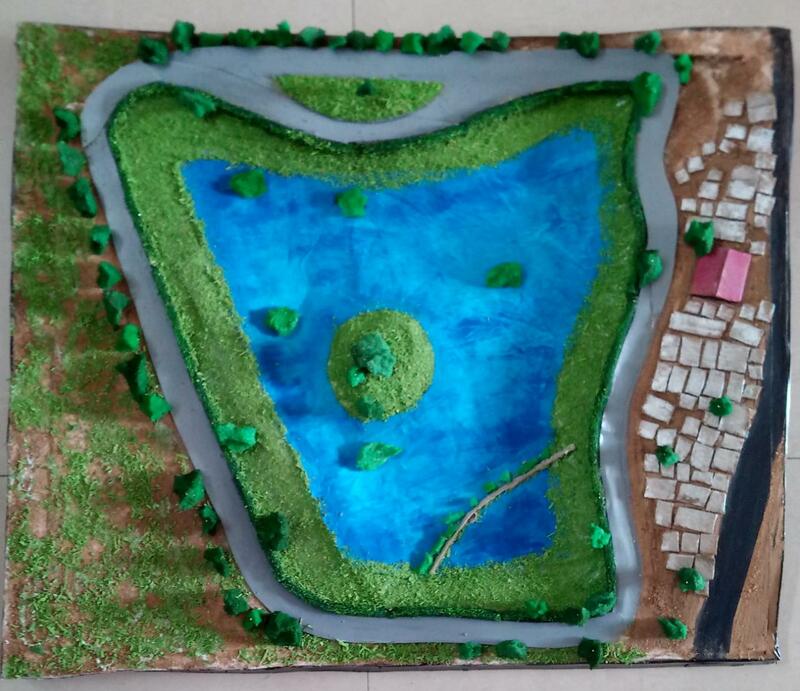 Being an architect used to making models, Ashwatha Chandran made a 3D model of Puttenahalli Lake in no time at all. Shana Gokul transformed the base model into an incredible replica of the lake (see pic). Two short "electricity poles" one either side of the viewing deck had a wire and a loop. The challenge was to take the loop from one end to the other without touching the wire and lighting a bulb in the middle of the water. The first two days were a little slow paced but on the third day visitors kept us on our feet from about 2 p.m. to 7 p.m! We lost count of the number of times we explained each photograph, what we did and why. And the games ... ah! They were such a roaring success! More so the lake game which was far easier even for shaky hands. The connect game turned out to be more of a guessing game for almost all. The only visitor to get it correctly was an employee of IBM. 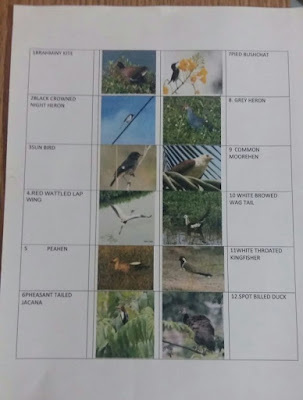 She first memorised from the base sheet and then quickly matched each bird correctly. This after swiftly and steadily whizzing through the lake game! 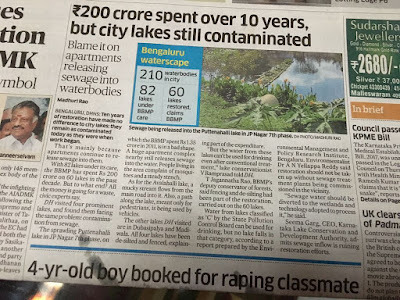 So many people told us about lakes in their localities that were in a bad shape. We suggested they take the lead to rejuvenate it. Lakes need to nurtured by the local community. The gain from this is theirs too! 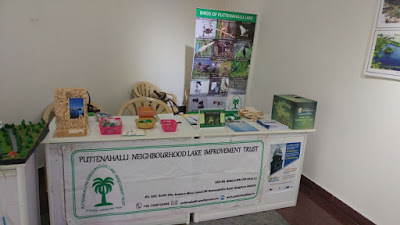 Heartfelt thanks to Harini Nagendra and Seema Mundoli for inviting us to participate in this event and to everyone who helped us with the exhibits. More photos can be seen in Srinivas' facebook album. If our lake could speak, it would have joined us in thanking each one of you. We are deeply grateful and, for want of another word, overwhelmed. We had contacted DH immediately after reading the article on 24th Nov. Subsequently we spoke to the Executive Editor as well. 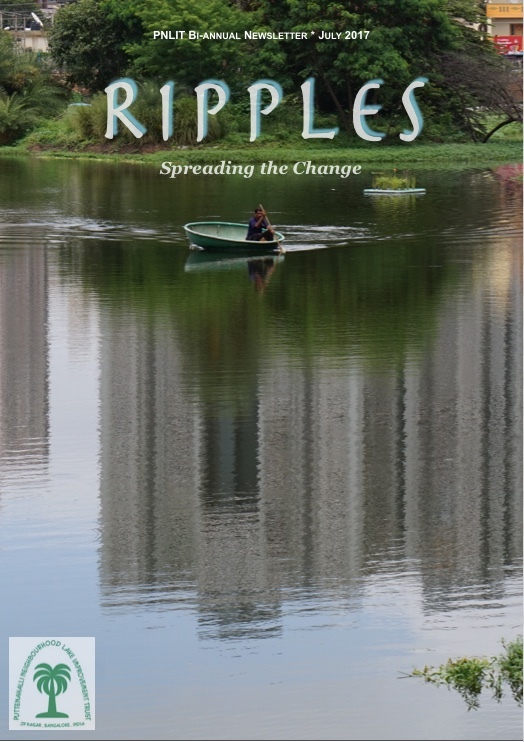 The photograph and text pertaining our lake have both been dropped from the online version. We have asked them to carry a clarification story likewise, on the front page. Once again with heartfelt thanks. 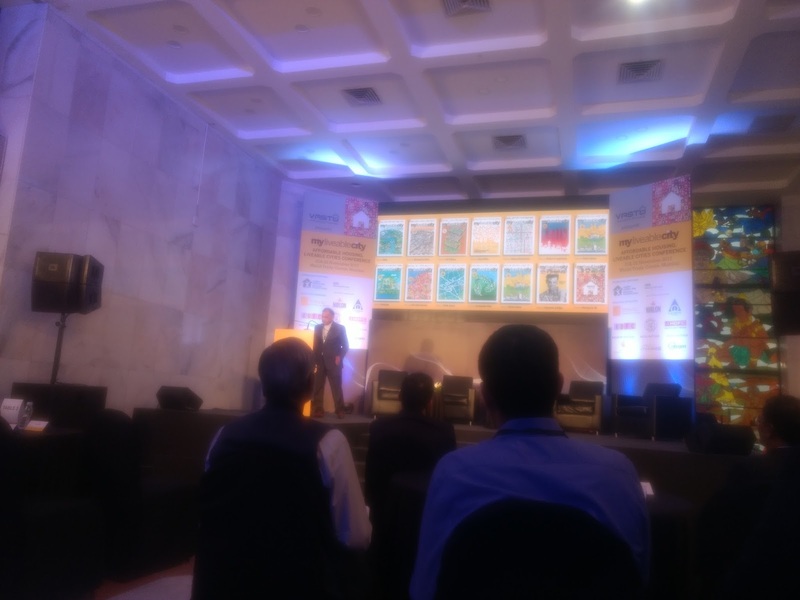 A few days ago, I had the privilege of attending the "Affordable Housing, Liveable Cities Conference 2017", organised by My Liveable City, at one of the halls of the World Trade Centre in Mumbai. 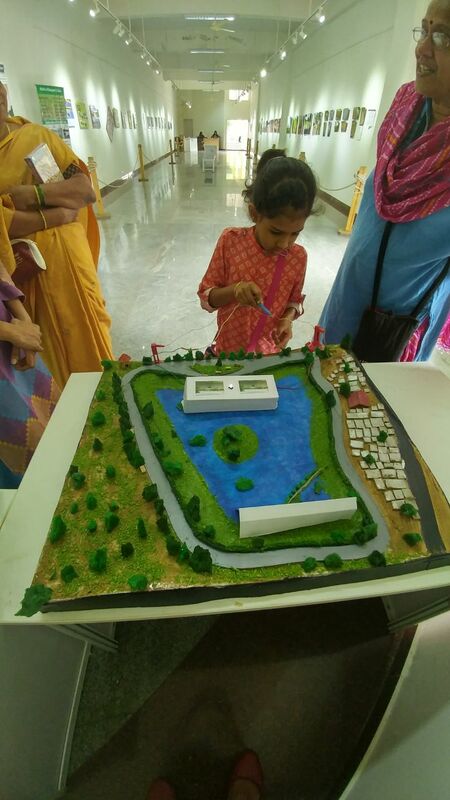 Held over two days, 21st-22nd Nov, the conference revolved around the Pradhan Mantri Awas Yojana, an endeavor to deliver 20 urban million homes by 2022, and what it would take to make this a reality. So the place was buzzing with the finest Indian and International minds delving into finance, design, development, urban planning and policy making. If you're wondering how I am associated with any of these, well, I am not! My Liveable City, is an international magazine, committed to its name. 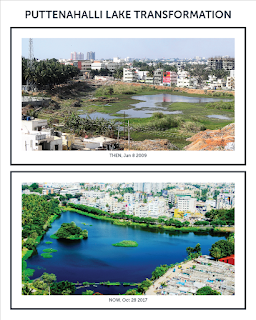 The latest issue Oct-Dec 2017 has an article written by an architect Yamini Kumar, about flora and fauna in our cities. 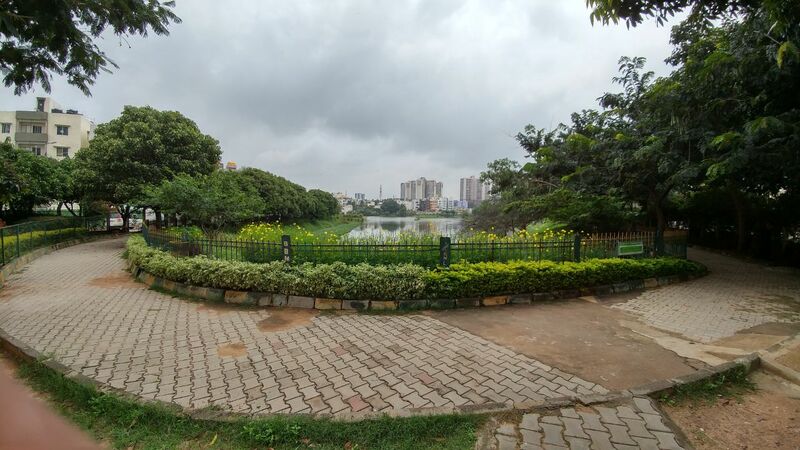 It mentions three spaces - Benthuizerplas in Zoetermeer in the Netherlands, Country Parks in Hong Kong and Puttenahalli Lake in Bangalore. You can read the article here. My Liveable City (MLC) is born out of a series of discussions between a specialist in city-design and a specialist in media and their commitment to contribute to create more liveable cities in India. Shyam Khandekar has nearly four decades of experience contributing to more liveable cities in Europe and India. 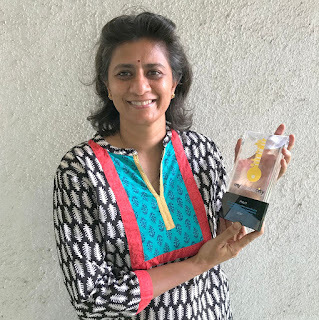 Shashikala Venkatraman has lived in cities across the world, and has extensive experience in media. Inspired by their commitment, they have been joined by young and talented professionals in city design, development and building from India and abroad who have been trained at the best universities around the world. A talented publishing team from India make up the balance of this team. Together they make the MLC project possible. During this conference, My Liveable City awarded the "key" to an imaginary perfect city to three individuals/institutions. PNLIT was one of them. 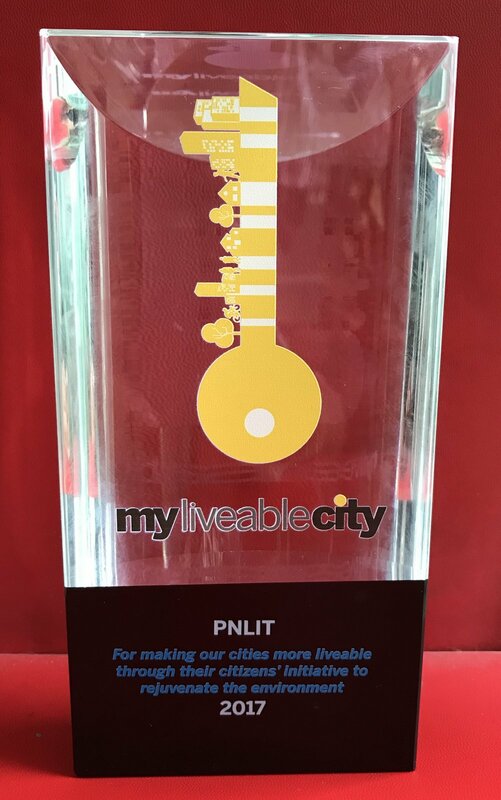 "For making our cities more liveable through their citizens' initiative to rejuvenate the environment"
Living in Mumbai, I collected the award for PNLIT. Sincere thanks to My Liveable City, Mr Shyam Khandekar , Ms Shashikala Venkatraman and others, for the recognition. It was rather humbling, for a small citizens' group that happened to get involved with a small waterbody, in some obsure part of a metropolitan suburb, to be rubbing shoulders with CEOs from big banks/financial instituions, and renown designers/builders, from India and abroad. I take this opportunity to share the good work of the two other awardees. His architectural firm, since 1981, is committed to an architectural practice based on the principles of environmental sustainability and social responsibility. He has been engaged in architectural education for a few decades, having developed appropriate curricula and teaching methods. Distressed by the plight of the urban poor in search of housing and livelihood in cities, in 1985 a few likeminded architects, urban planners and social workers came together to establish MASHAL. As an NGO, MASHAL strives to usher in development of the destitute and mobilises slum dwellers to improve their living conditions. They execute schemes which integrate multidimensional, multilevel and dynamic understanding of poor people's livelihoods. 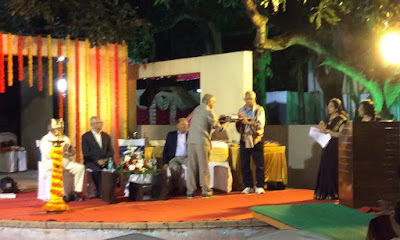 Mr Sharad Mahajan, the Executive Director of MASHAL, who collected the award, said that most of the founders are now dead, and this award they received is the first in the 32 years of their existence. Today's Deccan Herald article - a bit of a dampener. "The sprawling Puttenahalli lake in JP Nagar 7th phase, on which the BBMP spent Rs 1.35 crore in 2011, is in a bad shape. A huge apartment complex nearby still releases sewage into the water. People living in the area complain of mosquitoes and a steady stench." 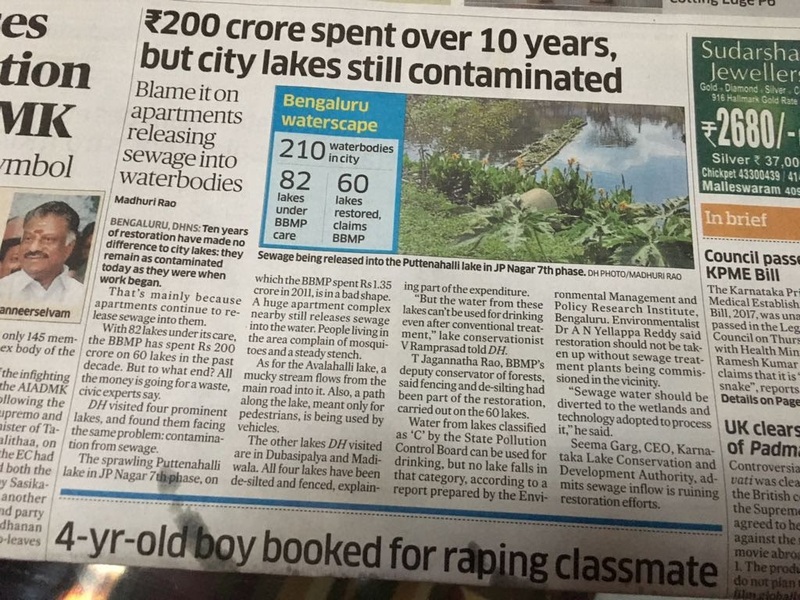 As caretakers of Puttenahalli Lake, reading such articles does make one feel angry on the one side, while on the other, one feels sorry. Sorry that today's journalists (some) are inadequately informed, and write without researching, and editors (some) could let this pass without a blink. 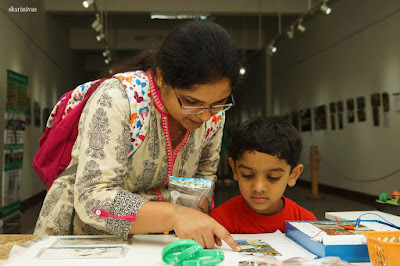 Deccan Herald - you can cross the road from your office to the Rangoli Metro Art Centre. The caretakers of Puttenahalli Lake (PNLIT) are there 24th-26th Nov, 11 am - 7 pm with the real lake story. Not fake news! You will see that you owe this rejuvenated lake a sincere apology. Azim Premjii University is organising a three day event "Celebrating the Urban Commons" 24th-26th Nov, 11 am - 7 pm, at the Vismaya Gallery at Rangoli Metro Art Centre, MG Road. The objective is to build awareness both about the existence of nature in city and also to emphasise the importance of nature for cities such as Bangalore. Please see below for details. PNLIT is exhibiting the story of Puttenahalli Lake through photographs. Do come. We've had and will continue to have, diverse events at the lake to bring the neighbourhood together. 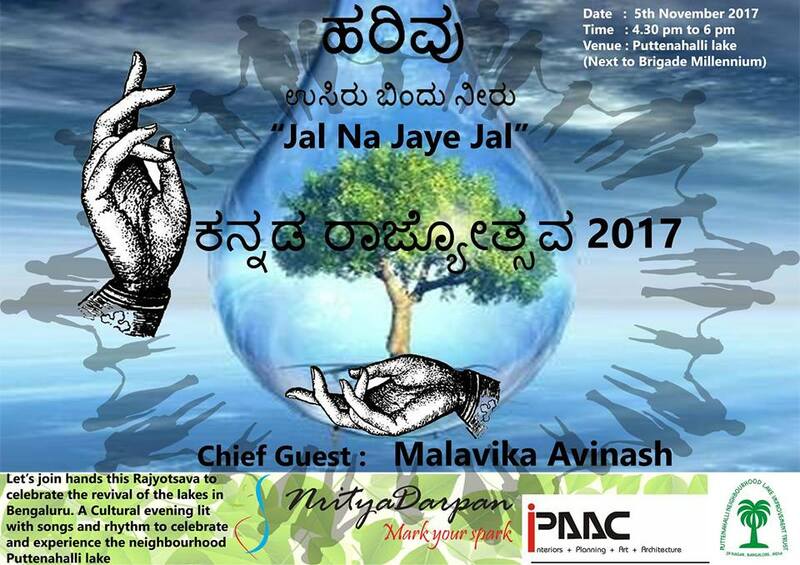 The Nrityotsav on 5th November, held in collaboration with Nritya Darpan and IPAAC, was unique for more than one reason. This was not only our first formal dance programme but also that it took place on a stage specially set up, with the water in the background and birds flying overhead. Also the first time in terms of the number of artists (90?) from little ones aged 7 (I guess) to shall I dare say, 45 years? The dancers were accompanied by their relatives and friends so the crowd was different too. Most of them were visiting the lake for the first time. Another first was that we had any Chief Guest at all. 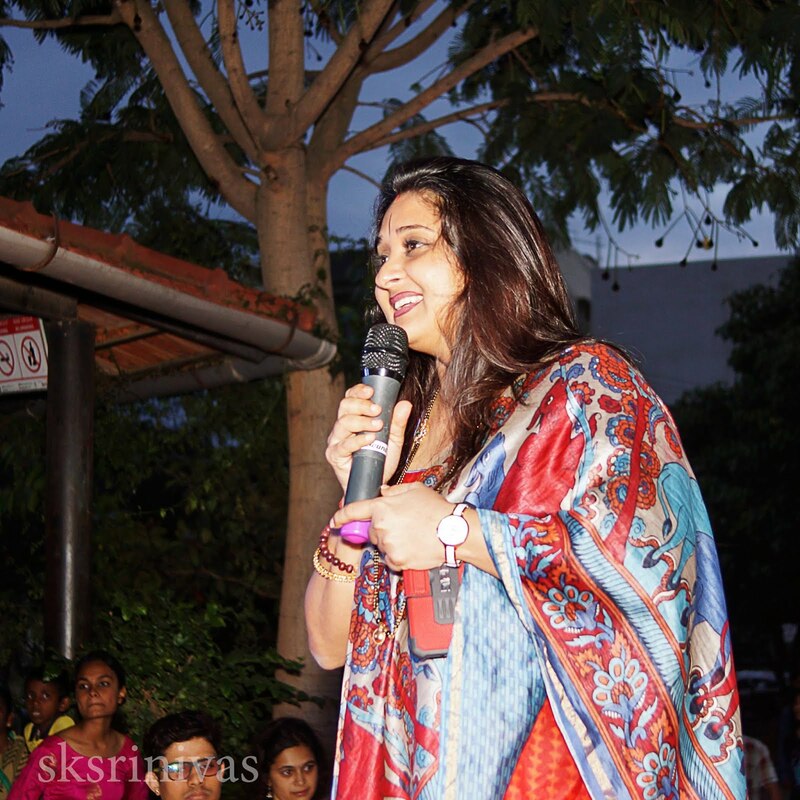 We had two - Ms. Malavika Avinash, the renowned Kannada actress and Mr. Ganesh Reddy, Founder of Stayfit Health and Fitness World Pvt. Ltd. Both of them were as amazed as the gathering was at the pristine lake, the lush trees and clean surrounding. 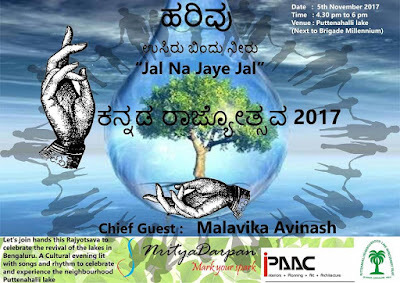 Invited to speak, Ms. Avinash began by saying that with such heavy rains, instead of asking people where they live, she's tempted to ask in which lake they live. "We have demolished rajakaluves," she said. "Constructed buildings over storm water drains, and now with the rains, we complain of water gushing into our homes. We need to protect water whether it be a pond or a lake." 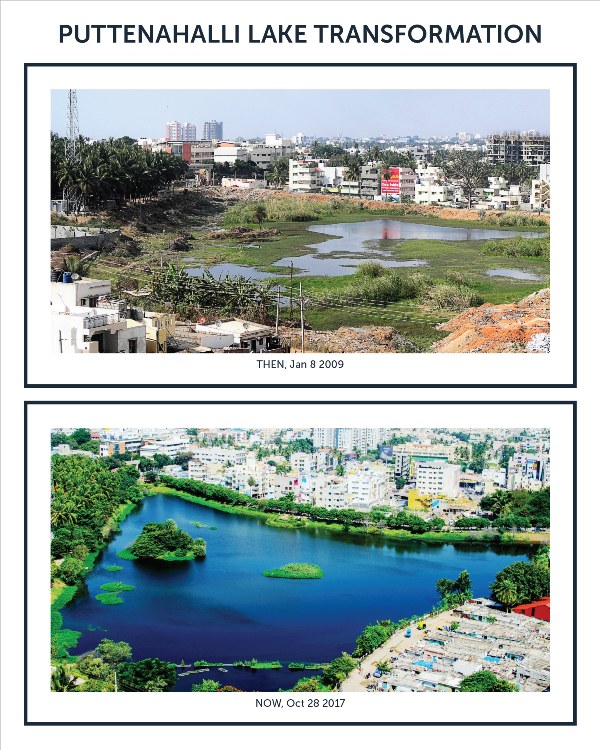 She remembered the Puttenahalli Lake being much bigger than what it is now but in the same breath she complimented PNLIT for preventing it from shrinking further. 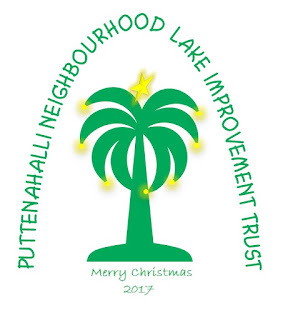 She lauded the neighbourhood for supporting PNLIT in nurturing the lake. The usual venue for a cultural programme is an auditorium, she said. Holding the dance programme at the lake made it special. It has become a place for the community to gather. This is much needed especially in a city like ours where common spaces are shrinking. The singing and dancing by students from Nritya Darpan were an apt tribute to the lake and indeed to our rich culture and land she said to huge applause from the audience. 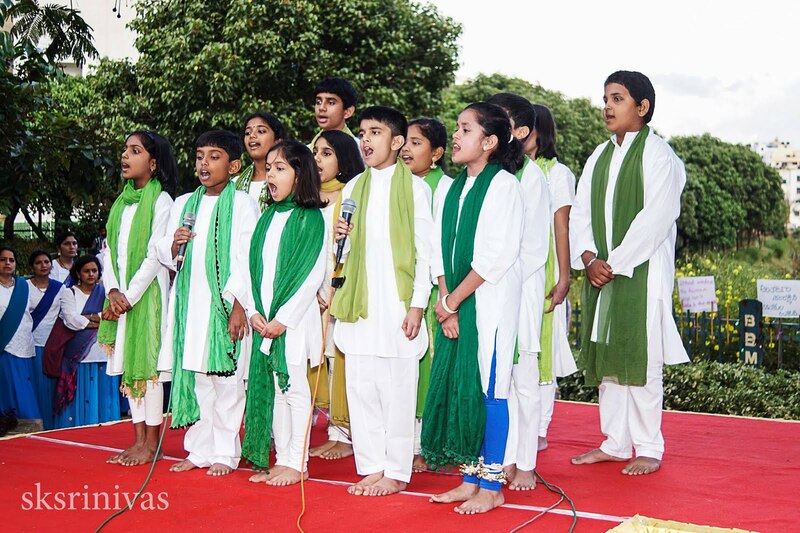 Given the occasion, celebration of Karnataka Rajyotsava, the evening began with young girls and boys singing the state anthem, "Jaya Bharata Jananiya Tanujate." 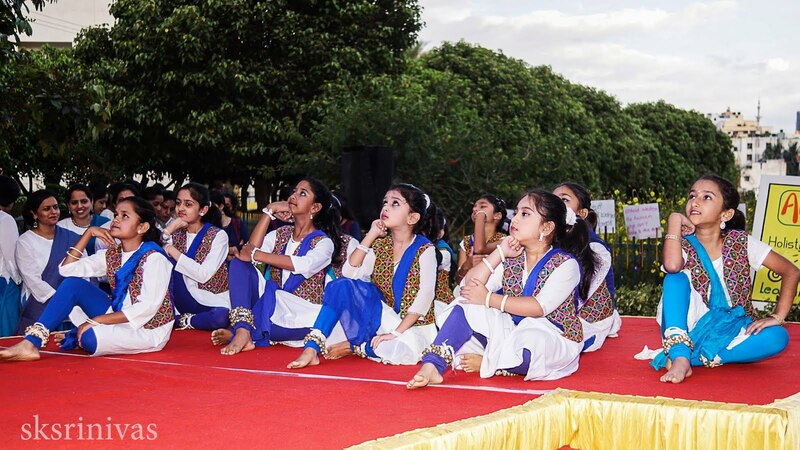 The songs and dances that followed in quick succession were interspersed with short recorded commentaries on the best of Bengaluru and how to make it even better. The dancers, even the young ones, were so graceful! They did not let the smallness of the stage come in their way. 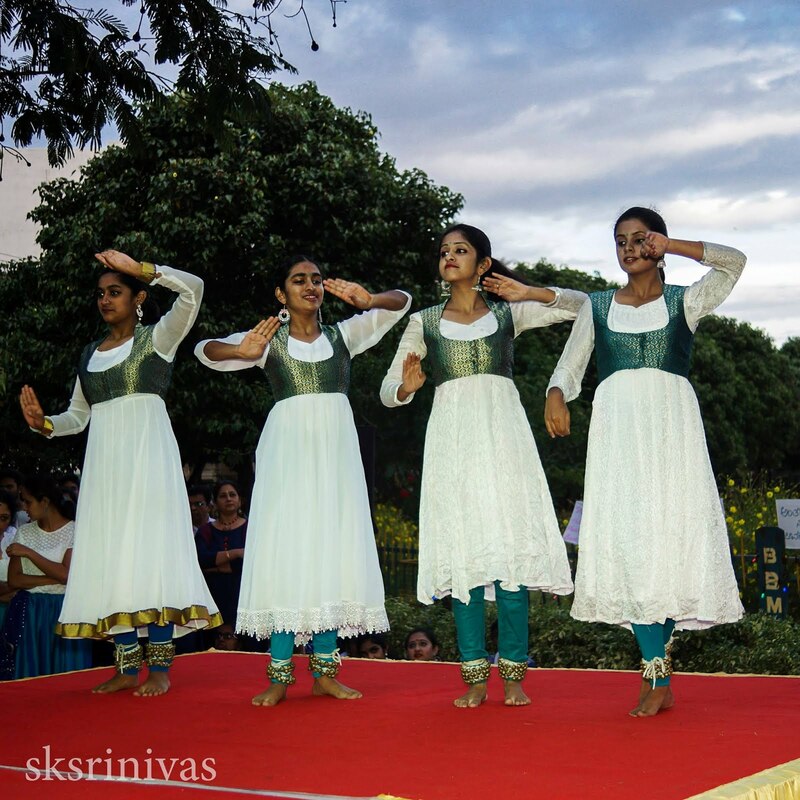 With flourish and flair they breezed through a range of styles from Kathak, Mohiniyattam and semi classical. As the sunlight faded, the finale items, "Namami Gange" and "Jal na jaye jal" were performed by the gurus Ms. Veena Bhat, Ms. Vinaya Narayanan and Ms. Uma Maheshwari. They became graceful silhouettes against the evening sky. Towards the end of their performance, their disciples joined, each one with a little lighted lamp, going around between the audience and their gurus on the stage. 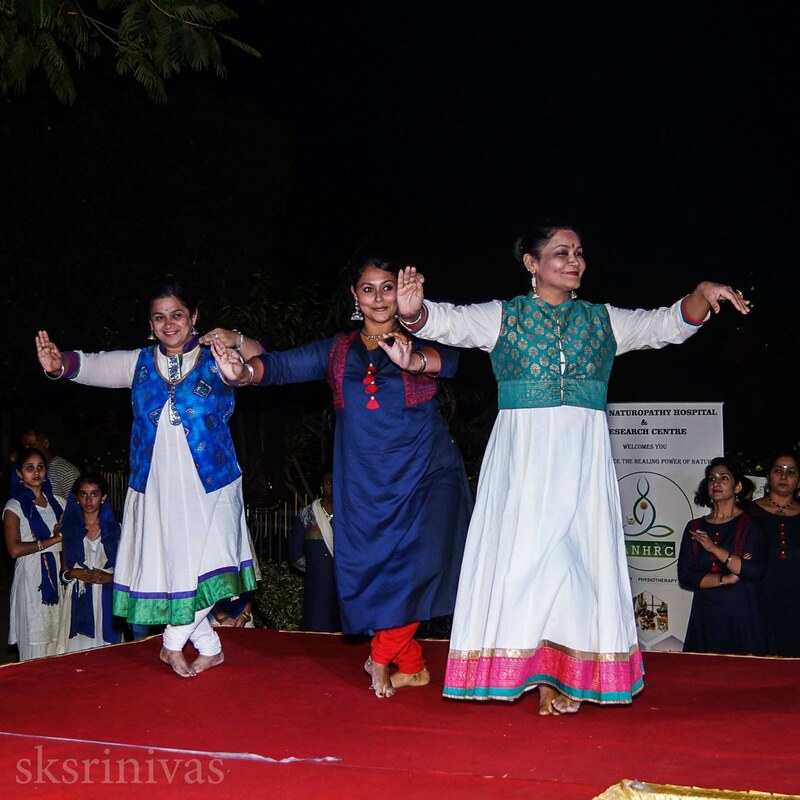 The comperes Ms. Sinchana Murthy and Mr. Ravi Bhat maintained the tempo beautifully. 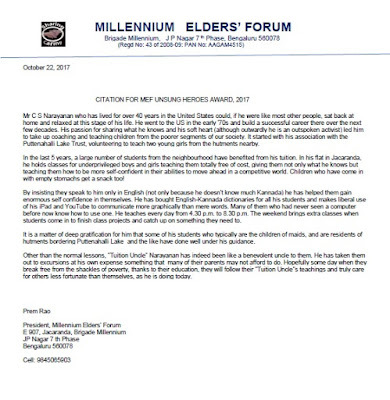 It is with great pride that we share this news - the Millennium Elders' Forum has bestowed PNLIT volunteer, Mr. C.S. 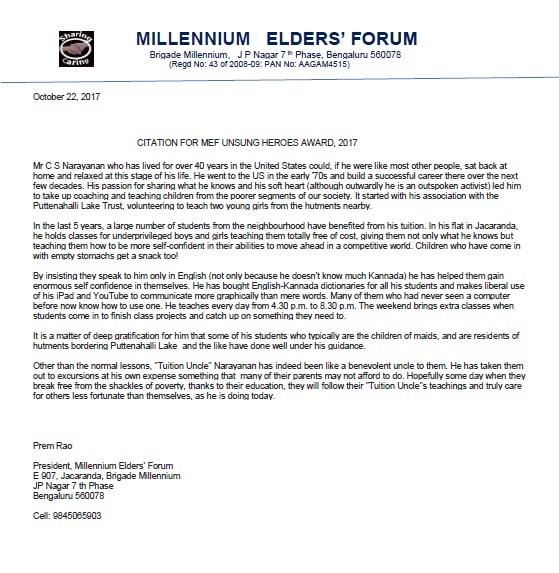 N. Iyer with the MEF Unsung Heroes Award 2017. He was felicitated at a glittering function held last month. We remember how he was one of the first persons to respond when we sent an appeal in Aug. 2012 seeking volunteers to teach underprivileged children from the neighbourhood. His only hesitation was that he did not know Kannada. Also, having lived in US for most of his life, his English may be difficult for the children to understand. We coaxed him by saying that the children might as well learn to speak American English than none at all. He was a natural teacher and the students took to him. 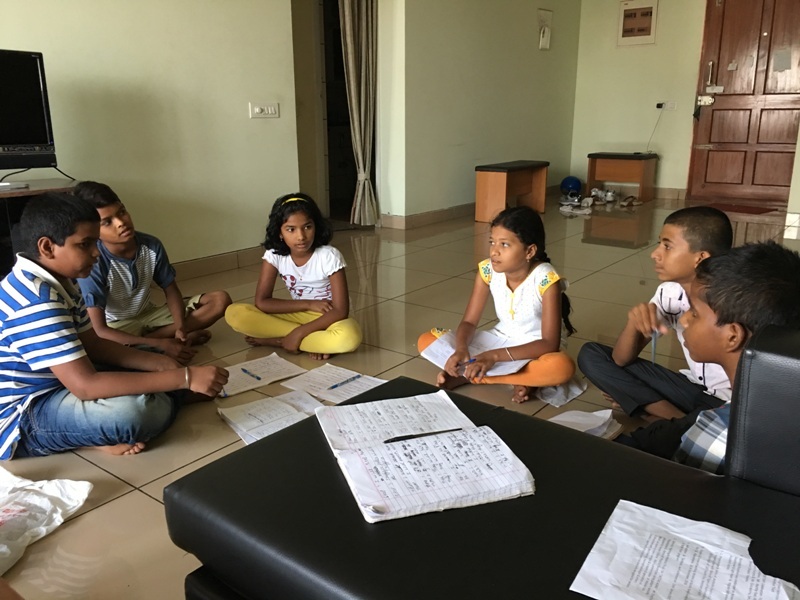 We had to discontinue our teaching programme at the lake but there was no stopping Mr. Iyer. He continues to teach and guide new batches of students. Kudos to you, "Tuition Uncle!" The MEF Unsung Heroes Award may be at the neighbourhood level but you are certainly making a difference to many young lives. In connection with Karnataka Rajyotsava, we, Nrityadarpan, IPAAC and PNLIT are happy to announce a dance programme at the Puttenahalli Lake premises. Once on the verge of extinction, the lake is now alive and brimming. It has undergone a transformation and how! What better venue than this to engage with and become one with nature? 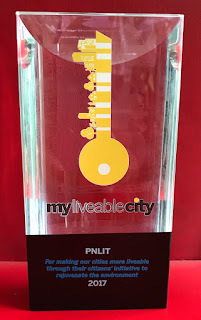 The PNLIT Calendar is back! 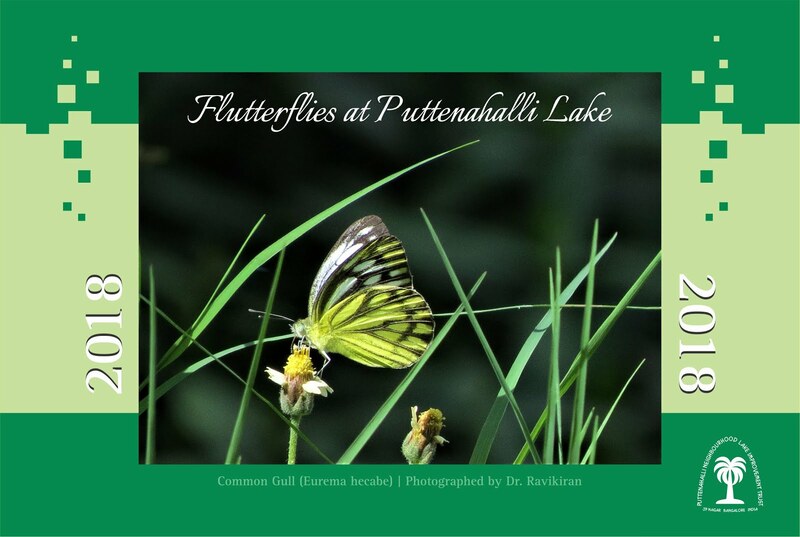 Capturing a few of the best of our lake, we'd brought out calendars for 2014 showcasing birds and for 2016 on the exciting Life at the lake. 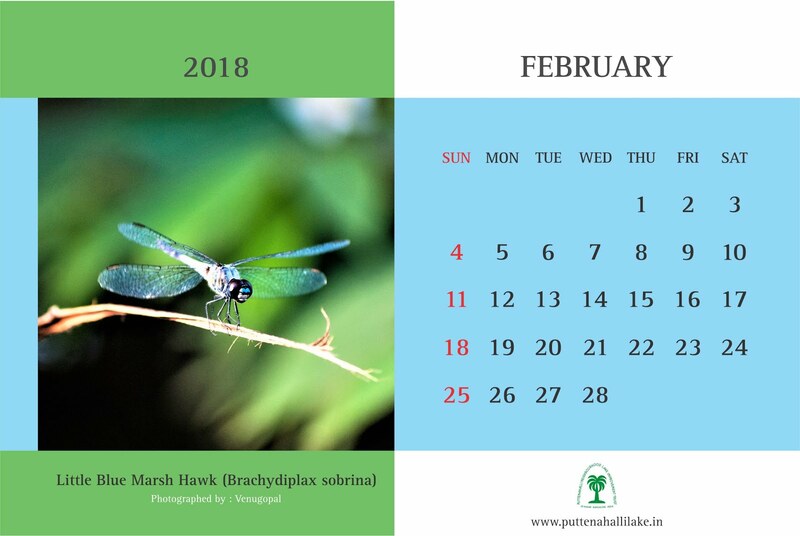 The theme for 2018 is butterflies and dragonflies. Anyone who goes even occasionally to the lake cannot help but notice these fragile little beauties flying everywhere. Appropriately titled "Flutterflies at Puttenahalli Lake," the exquisite photographs have been shot by our shutterbugs. The calendar has been designed by Arpit Agarwal, a talented designer from the National Institute of Design, Ahmedabad. Size - 5.7" x 8.5"
This is an advance intimation to help us decide on the number of copies we print. The cost per piece is likely to be between Rs. 210 and Rs. 230. Bulk orders from companies are most welcome. The logo and the name of your company will be printed on this eye catching calendar. Please pitch it to your PR department. Let your wings and ours flutter through our calendar! Our meetings with visitors to the lake happen either by prior appointment or by chance. We see someone looking intently at a bird or a tree or at one of our information boards. Invariably, we will go up to that person introduce ourselves and start talking. If they happen to have a camera, you can pretty much be certain that we will strike up a conversation with the stranger. Much like Coleridge's ancient mariner. :-) Each stranger could be a potential resource person who can help us and the lake with their knowledge, time or a donation. It doesn't matter if they are none of these. We hope they will come more frequently and develop a bond with the lake, with Nature. Our meeting with Dr. Harini Santhanam, a post doctoral researcher at IISc. on 21st Sept. was by design. We were excited to meet someone who could give us some tips on conservation. She did exactly that. Our discussion lasted for nearly two hours and was a brainstorming of ideas and sharing experiences. Meetings prearranged or accidental are followed up with an email, usually from us. Dr. Harini however wrote a poem after her visit to the lake. We were reminded of Padma Bhushan Smt. Sudha Ragunathan's song in praise of lakes she'd sung at the PNLIT fund raiser concert in Feb. Such tributes come from the heart and we cherish them. to keep the lake alive and happy, come what may! start and end in human hearts! Story telling at the lake has always been a magical time both for us and the participants. We love to see the looks on the children's faces match the story teller's. The event on 9th September to celebrate International Literacy Day took the excitement to another level altogether. It combined story telling with drumming! The heads were too many to count but we would put the figure to over 70 kids. As for adults ... Parents, grandparents, regular walkers at the lake, passersby ... This was the best attended event we've had at the lake so far! We loved it especially because it drew people, young and old from the entire neighbourhood around the lake. 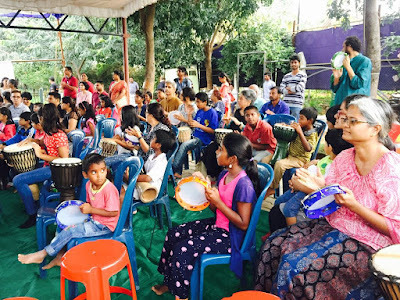 Today the Putanhalli Lake was all set to welcome the kids and parents for perfect combination of story telling and drum jam. 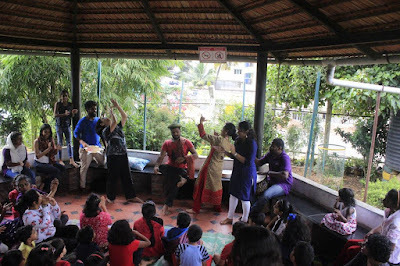 Snehadhara team had high energy start for the story telling session with prayer to impress rain god by all kids. Voice modulation to adjust the natural sound and Making melodies in my heart with perfect stretching to set the kids for story telling session. 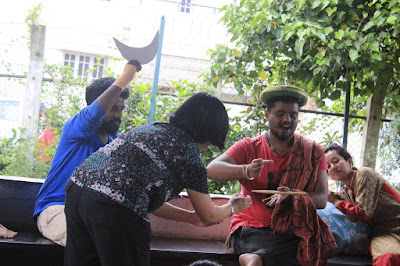 The Story on Yawning King was exciting for kids to share many ideas and make it creative and highly interactive. Story session concluded with experience of the lake by all kids forming perfect chain and going around the beautiful Puttenahali Lake and singing songs. 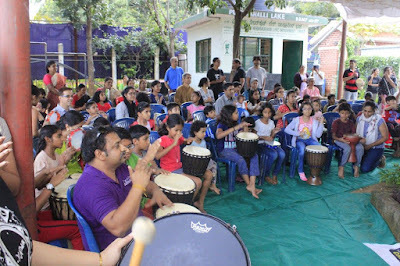 Drum Jam was amazing for kids and parents to participate and synchronise with the groups. It was a great session that showed us coordination, concentration and fun can be achieved at the same time. "I loved it !!! It felt so amazing to play the drums, I thought It was really fun to make up beats and hear everyone play differently." is what my 9 year old daughter Zain has to say. I echo her feelings. It was indeed a really nice event at many levels. Adults and kids playing together, inviting and including the kids from the local neighbourhood, not only the gated community neighbourhood, but the kids who live around the lake in the little settlements who were as much a part of the event made it a really special community activity. 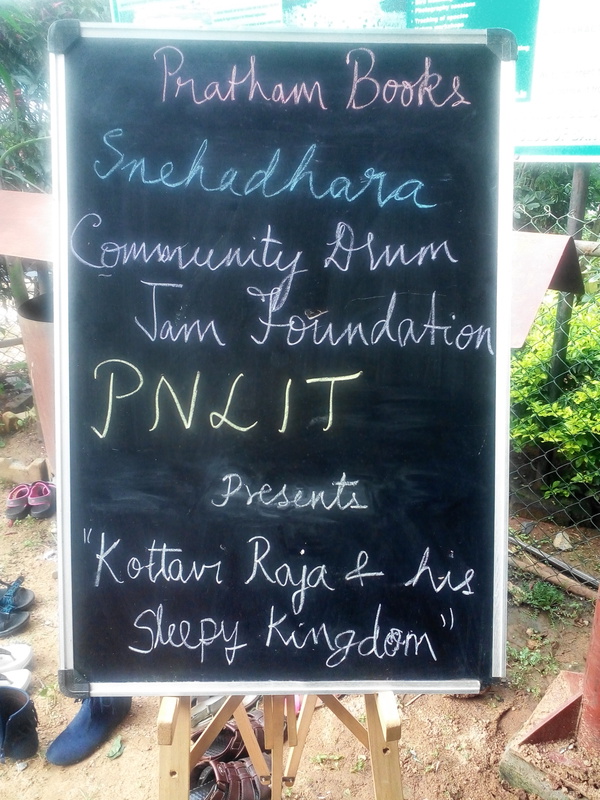 Thank you to PNLIT, Snehadhara, Pratham books and the Drumjam team for making this a fun and meaningful experience! 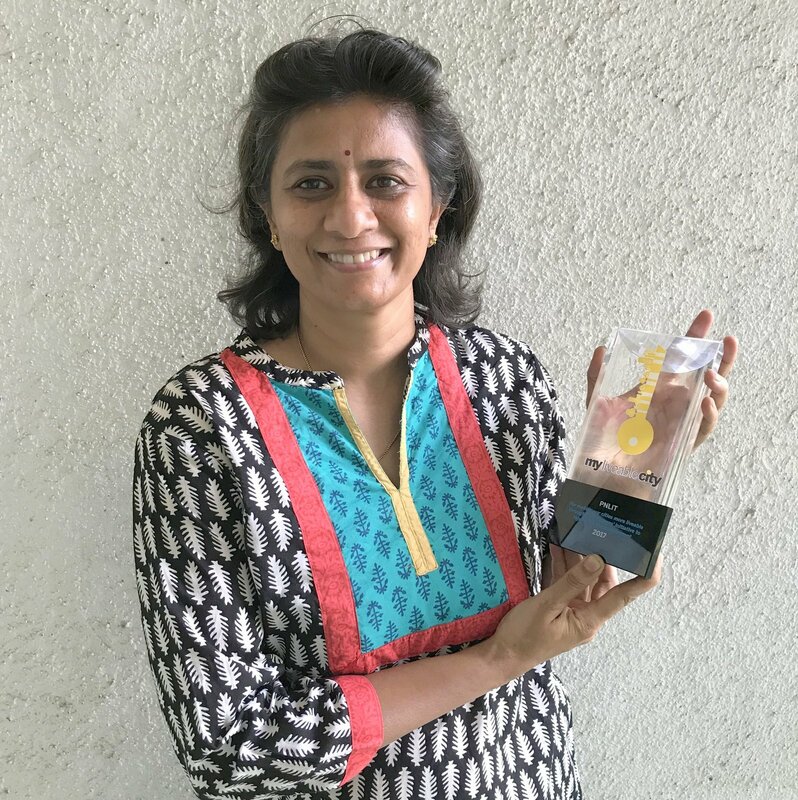 Thanks indeed to Pratham Books for their 'One Day, One Story' annual storytelling campaign. Snehadhara Foundation (as always you were brilliant) and our new associate, Community Drum Jam Foundation. Special mention must be made of Chhaya, the whistler extraordinaire! Her sharp clear whistles stood out above the drumming! 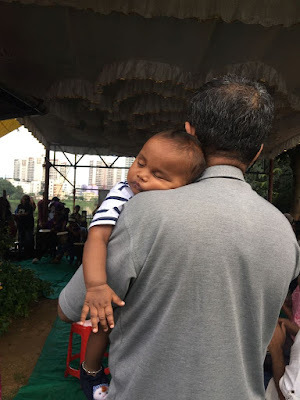 We couldn't help noticing an infant sleeping blissfully on his father's shoulder completely oblivious of the raw energy so palpable throughout the evening. You wait, little one. Your turn to come to our lake for an event like this is not very far off! Join an interactive storytelling session which will be using voice, theatre and movement and participate in a drum circle where you will play on the drums, djembes and other percussion instruments! Because 'One Day, One Story' the annual storytelling campaign of Pratham Books that runs around International Literacy Day is back! And like the past few years, PNLIT is a part of this program along with Snehadhara Foundation. Supporting Snehadhara this year is the Community Drum Jam Foundation (founded by Vasundhara Das and Roberto Narain). 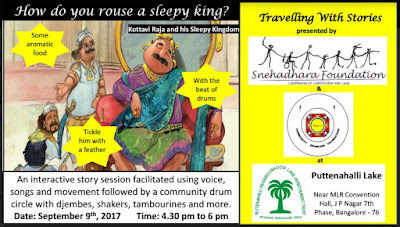 This year's chosen book is Kottavi Raja and his Sleepy Kingdom (written by Yasaswini Sampathkumar and illustrated by Henu). 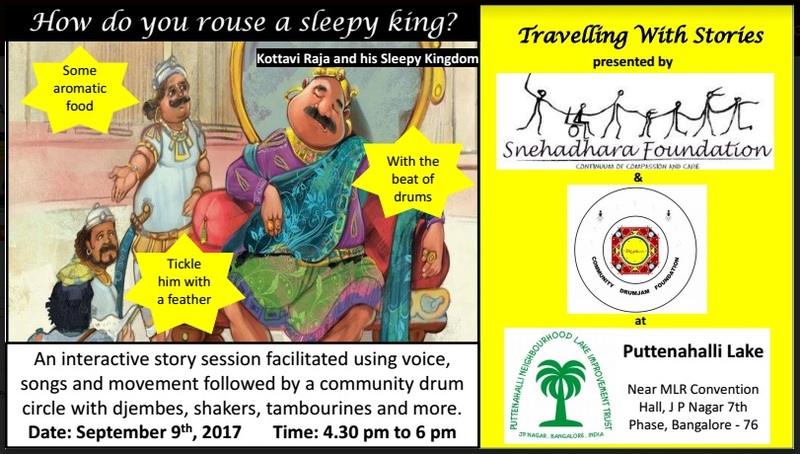 So travel to Kottavi Raja's land with Snehadhara and Community Drum Jam at Puttenahalli Lake to find out what happened there. Date, Time - 9th September (Saturday) 4:30 p.m. - 6:00 p.m.
Kindly assemble by 4:20 p.m.
Register your child/children's name by sending an email to sapana_rawat@yahoo.com. We need to get a head count hence its very important that you register. We look forward to seeing a whole bunch of children at the lake. On 23rd August, we went with our gardener, Jayanna, to Madiwala Lake and showed them how to make a prototype, inserted canna bulbs and finally floated it in the water. 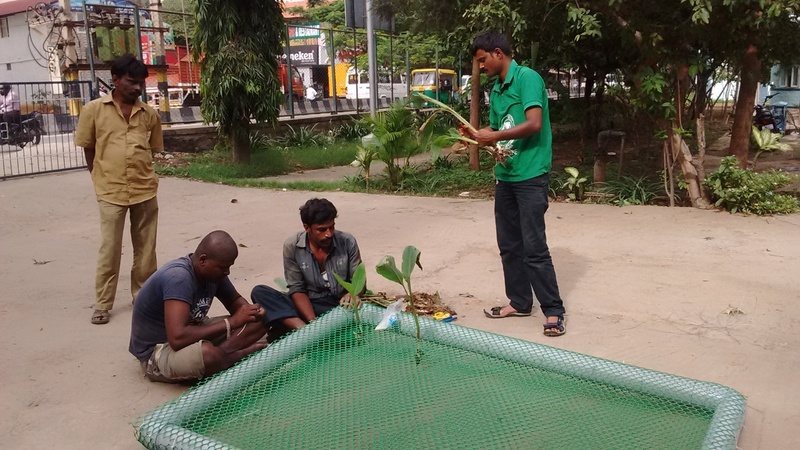 I don't know who was more thrilled - KLCDA officers, their gardeners or our PNLIT team! We are pleased to release the July 2017 edition of the Bi-Annual Newsletter titled "RIPPLES" from Puttenahalli Neighbourhood Lake Improvement Trust (PNLIT). 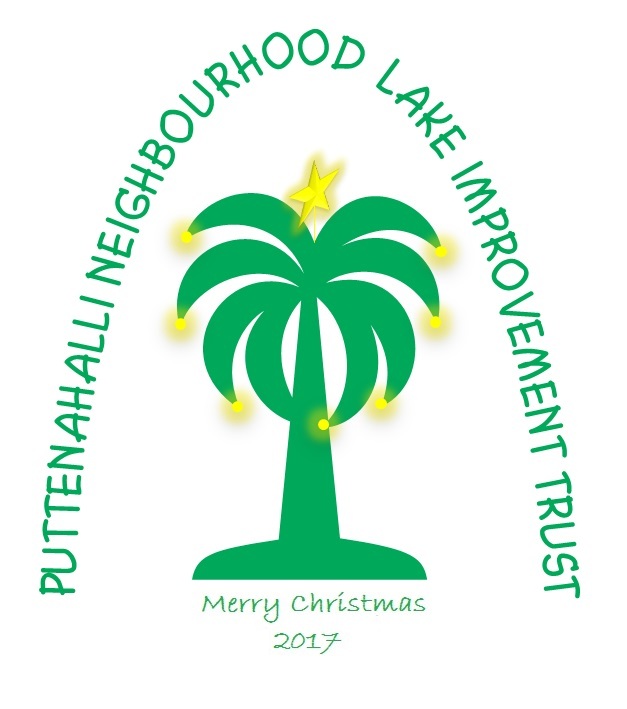 As a well wisher of the PNLIT and the lake, we hope you enjoy reading our newsletter! Click the pic below. Those of you like me, who live away from Puttenahalli Lake, would be wondering how the lake looks after the torrential rains of the past couple of days. 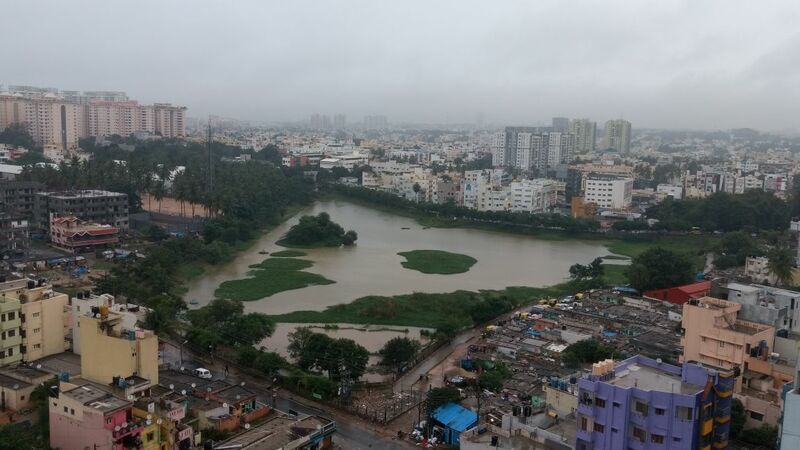 The pictures of Bangalore on television showed that the rains were so heavy that roads became like rivers, complete with floating boats. So the image of the lake that I had was one brimming with water. This was not far from reality, but it's muddy water! 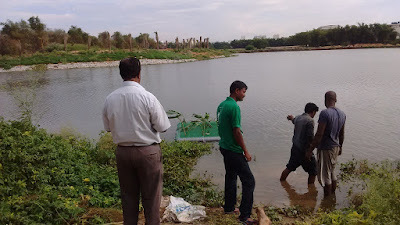 Fellow trustee Nupur shared some pictures after surveying the area yesterday. 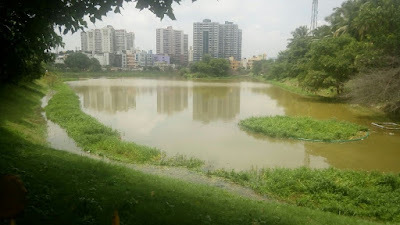 "Continuous heavy rains created a lot of changes in the lake", she wrote. 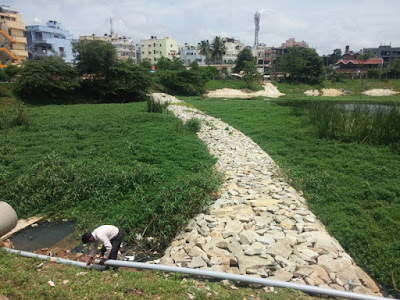 Drains with trash are common in Bangalore and the rapidly gushing storm water drain streams that feed the lake brought with them lots of undesirables. 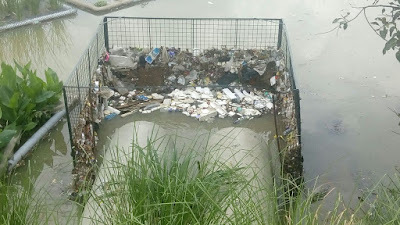 The silt traps where we'd fitted grills caught a lot of trash. 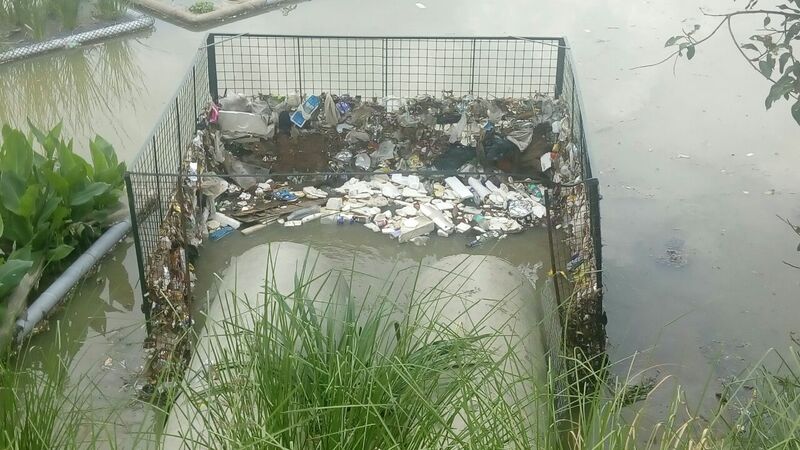 There were other places however, where the trash flowed in. The wetland is totally spoilt. Our floating islands are scattered all around and will need to be rescued. Mud from the neighbouring plot flowed onto the walking track making it like a river of quick sand and risky for anyone to walk there. Much needs to be done to bring back the normalcy of a few days ago. Our staff has their hands full. And as they worked today, the birds, the fish and the snakes were found enjoying the new muddy waters. 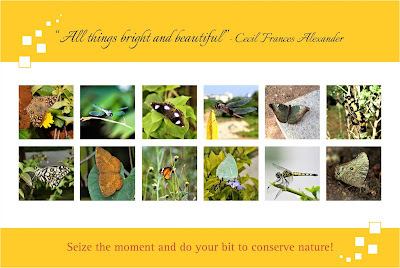 If you haven't heard about the Bangalore Butterfly Club (BBC), read this article which appeared in The Hindu two days ago. BBC is organising the next walk this Sunday, on 13th August at the Doresanipalya Reserve Forest, Arekere Mico Layout, which is reputed to have no less than 125 species! These walks typically start at 9 a.m. and end by noon. 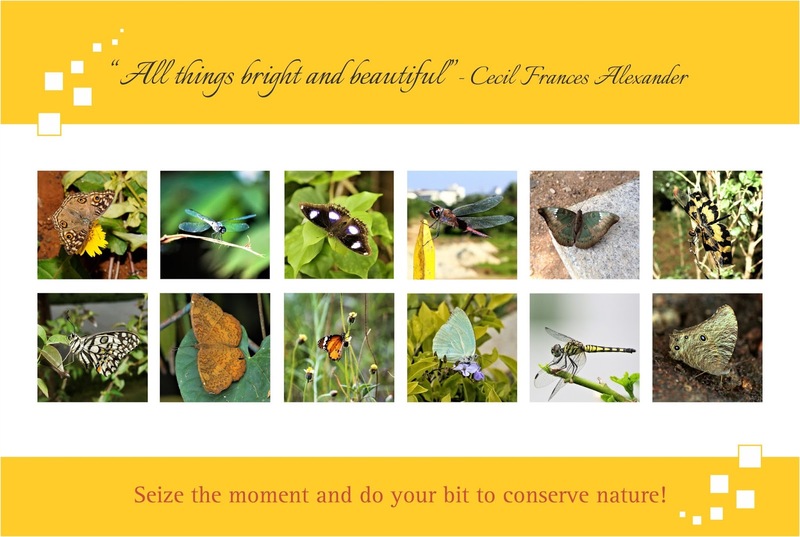 This is a wonderful opportunity for those even just a little interested in butterflies. If you'd like to join BBC on this walk, please confirm your participation at the earliest to Rohit Girotra <rohitashwa18@gmail.com>. Don't forget to give your mobile number as well. He needs to take prior permission from the forest department. Invariably these days visitors to the lake ask one question - what are those floating platforms in the water? Those of you who follow our updates on the lake would know that these are the Artificial Floating Islands we had first introduced in June last year. That was also when we signed an MoU with the BMS College of Engineering to test the lake water every month. Three prototype islands were joined by more. The plant species in the platforms increased and the water sampling points went up from four to seven. The BMS reports began to show a steady improvement. The results from site 1 (wetland) for July 2016 and 2017 are given further below along with an analysis of the results. As laymen, we believe what we see. We see the plants in the AFIs thriving (especially the Canna and how!). We see schools of fish and birds gorging on them (and growing plump!). 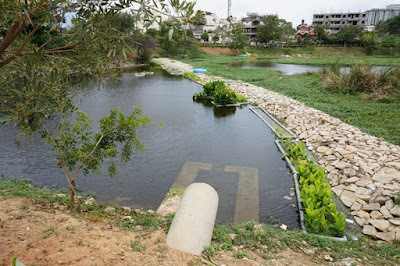 The eyesore in our lake was the wetland which is a crucial biofilter site but needs to be tended more rigorously than perhaps the rest of the lake since this is the main entry point for rain water. 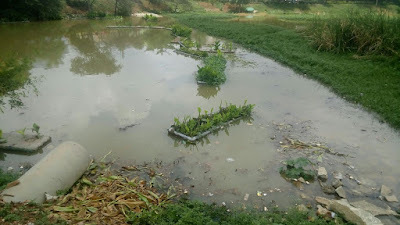 We decided to revamp the wetland which was an unholy mess with trash galore and water snakes everywhere. We came up with a plan to make the vegetation easy to maintain using the floating platforms. 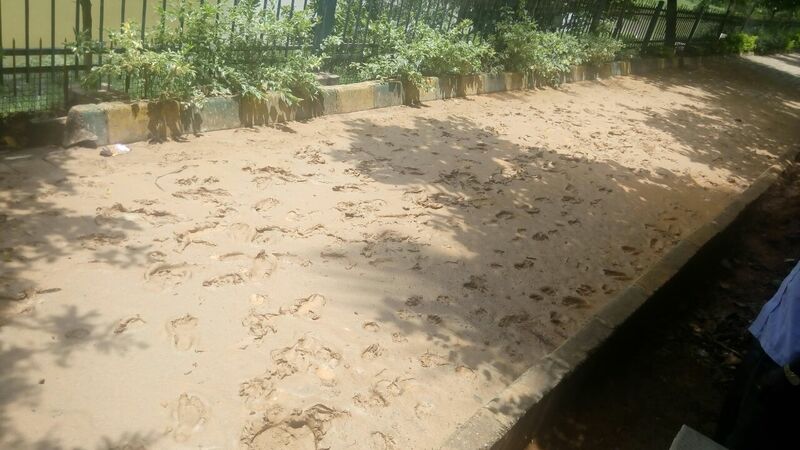 BBMP cleared the area in February and then again in April. Almost at once, the entire wetland became covered with sticky duckweed. The wetland which looked like a jungle now looked like thick pea soup! 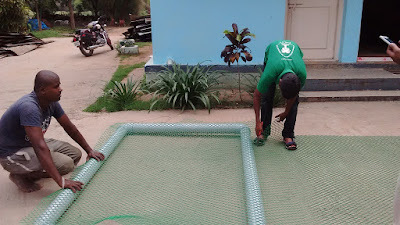 We remembered that the duckweed usually kept away during the monsoon hence decided to divert the treated water into the wetland. Voila! The duckweed vanished like magic! Our heartfelt thanks to our CSR partners in this project VMWare and Deloitte Shared Services India Pvt. Ltd. Some of their volunteers made a few platforms as well. 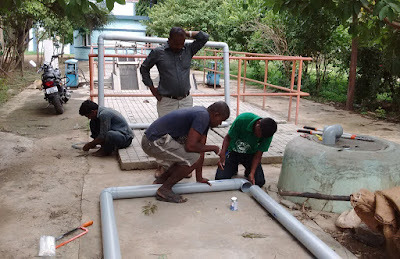 We are grateful to BMSCE for conducting the monthly water tests. Ever since we publicised the news of our AFIs last November, several lake teams have been visiting us. We are very happy to share our experience with all. 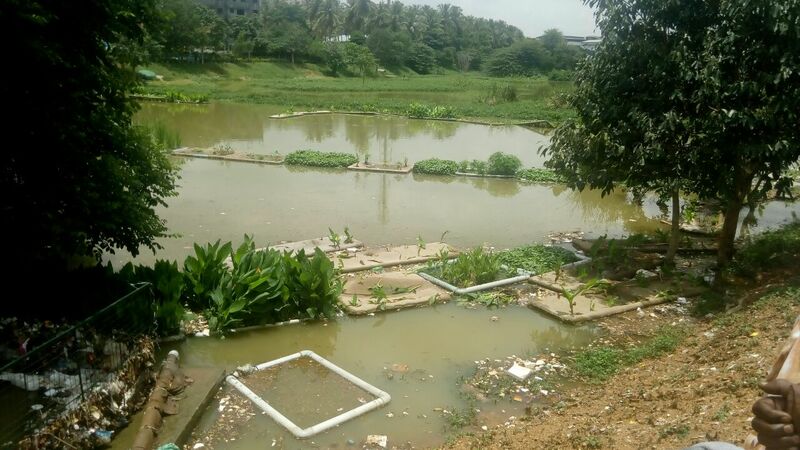 See below are the lab reports of water sample collected from the wetland at Puttenahalli lake. 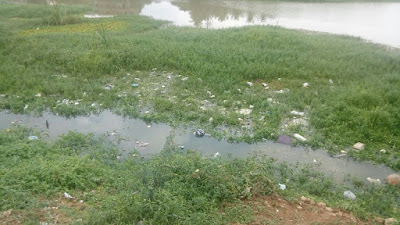 BOD (biological oxygen demand) : This is the primary indicator of water pollution. Lower the BOD level, the better is water quality. Compared to what it was a year ago, the BOD has decreased dramatically. That's really good. However, since BOD of 20 mg/liter is still considered severe pollution, we have some way to go. But, really good work all the same. Nitrates / phosphates: Significant reduction since the past year. In a literal sense, there is less crap in the water! Dissolved oxygen: Has gone up since the past year. Very good. This, I think, is due to the floating islands. Turbidity of the water has increased marginally since what it was a year ago. We need to see why this happening. Turbid water prevents sunlight from getting through the water and decreases plant photosynthesis. It may be due to the increased traffic inside the lake, i.e, increased use of coracle for fishing and weeding. Or it could even be the fish."